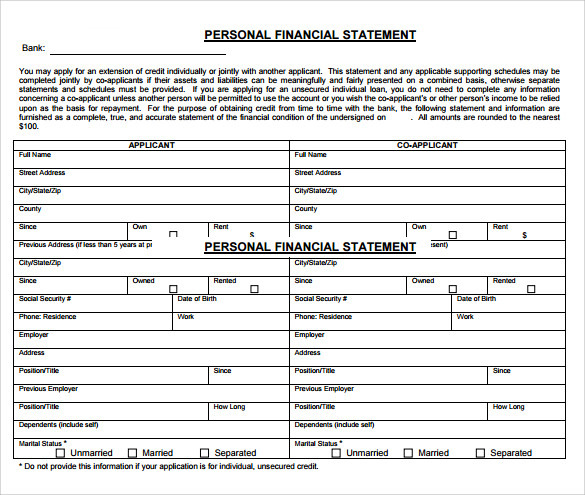 Every individual needs to maintain personal financial Statement that allows knowing the financial condition at the end of the month. Moreover, it also helps the person to know how much and where to spend. 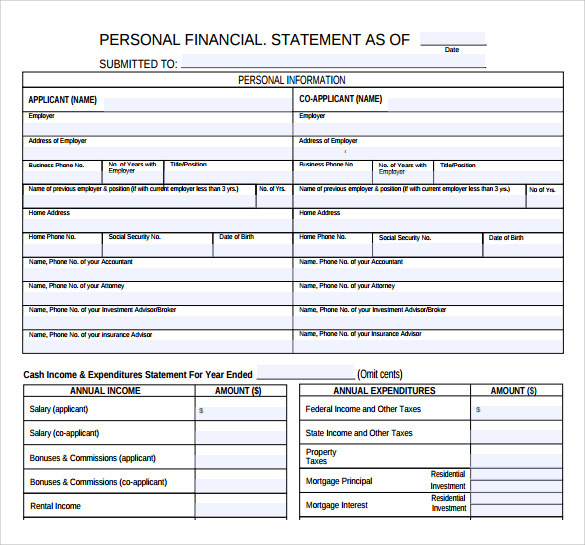 These Statement Templates carries all the details about the income and loss incurred throughout the year and the tax need to be paid accordingly. 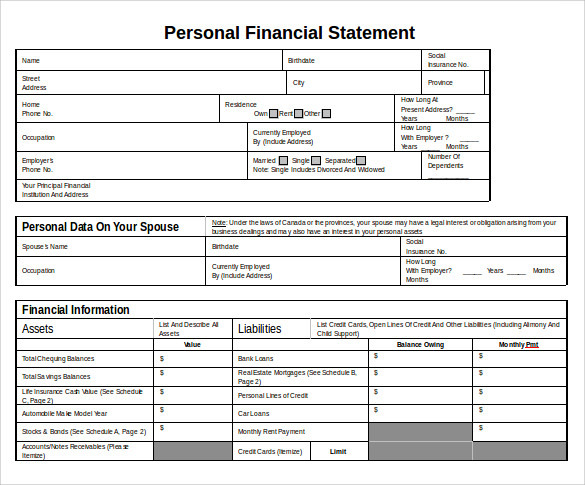 The sample personal financial statement allows creating on the statement at the best way and understanding the financial condition. Moreover, it also helps in spending the money accordingly for next financial year. 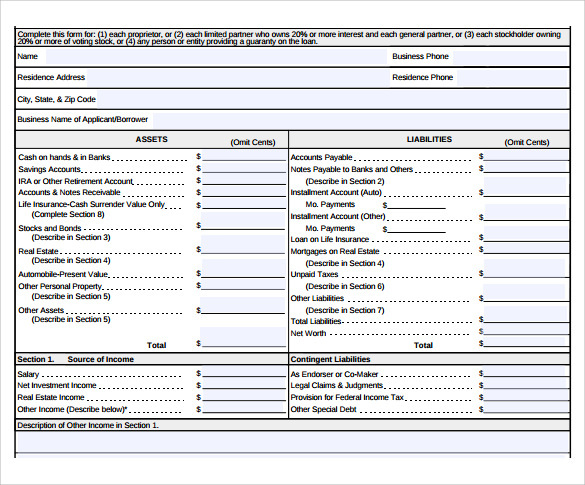 There is a provision of address, phone number, home address; city, state and zip code are listed with that. So that when it is used, offers an impression of everything that a particular user carries. 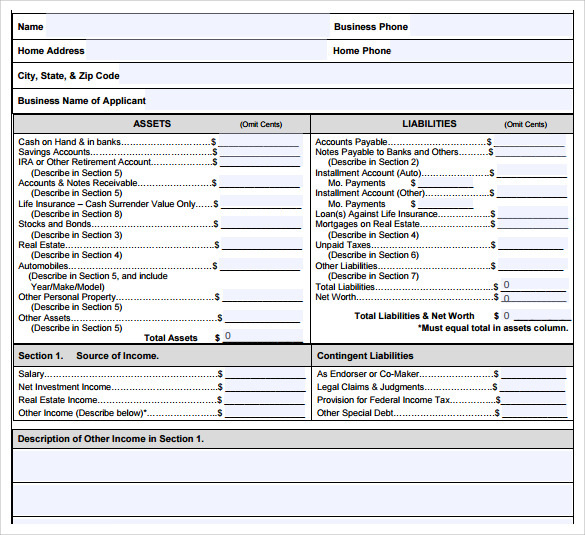 In addition to that there are three particular sections available where you can found assets, liabilities details along with their expenses as well. There are a portion of applicant and co-applicant are present over there where you can notify all your details including full name, address, phone number, employee details along with bank account details and phone number. Dependencies and their contact details along with the phone numbers are the other details that are included here. 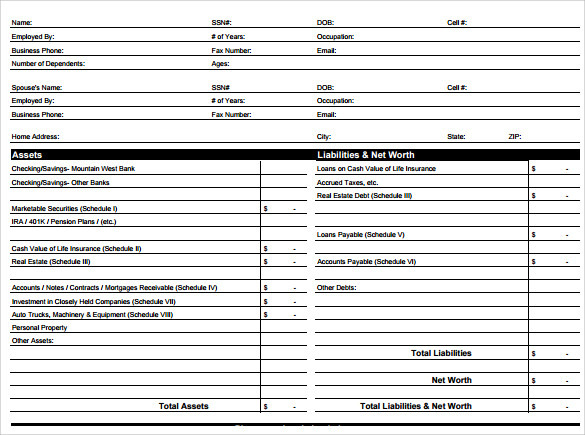 Assets and liabilities and net worth are the three basic factors that are included here. In addition to that, asset details along with readily marketable securities, ownership in privately owned business, notes receivables from businesses etc. These are available in beautiful table formats and ensure that all the details are listed in an organized manner. There is scope of annual income and amount along with annual expenditures and amount are available based on which total expenditure can be calculated. 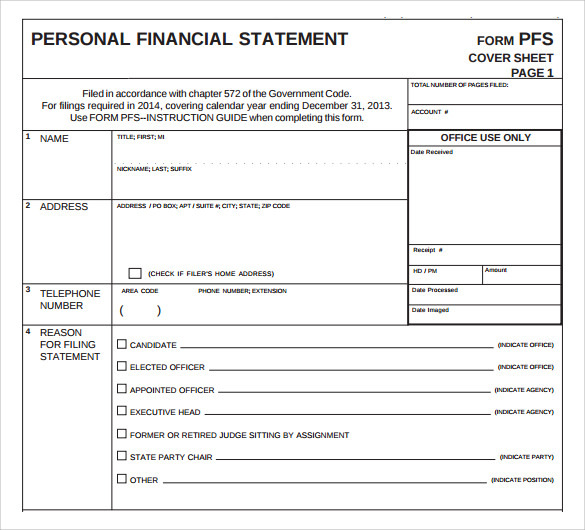 Why Does a Personal Financial Statements use? 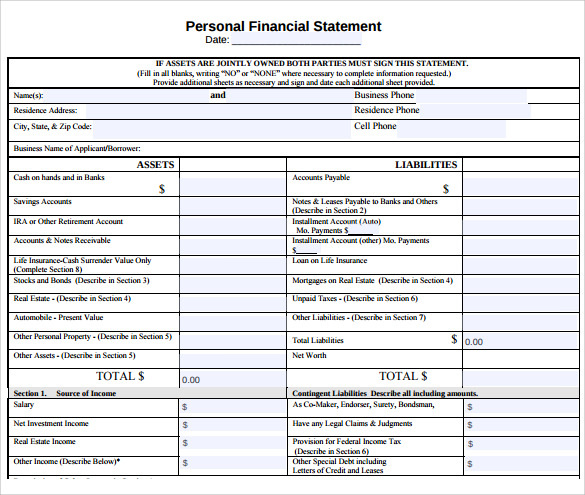 These types of financial statements are issued mainly for individuals where there is a scope for maintaining their expenses and incomes in a monthly basis. 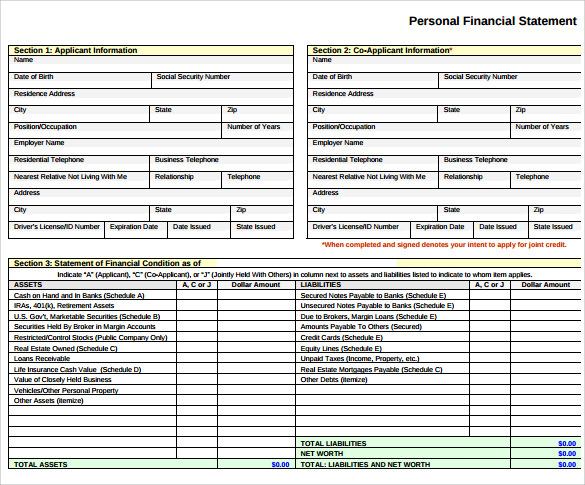 AS per requirements, these can also be used for maintaining your details for a weekly basis also. It helps to judge and validate your financial conditions in a more standard and organized way and makes them understand what the perfect financial condition of him / her is. 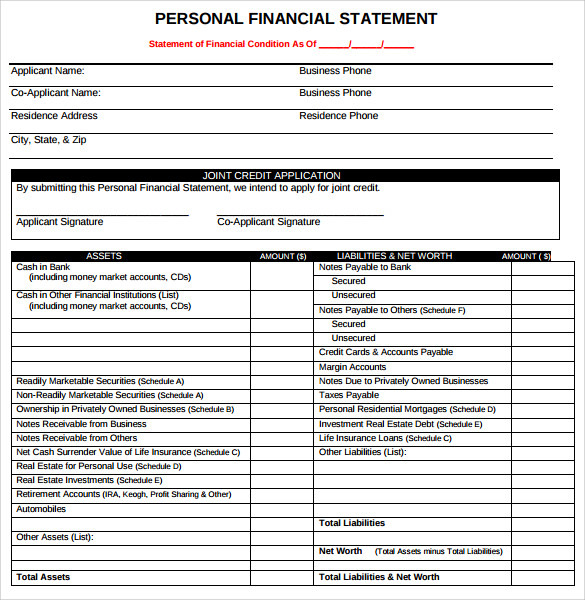 These templates are ideal to be used for planning your financial year in a more organized way.You can also see Sample Cash Flow Statements. 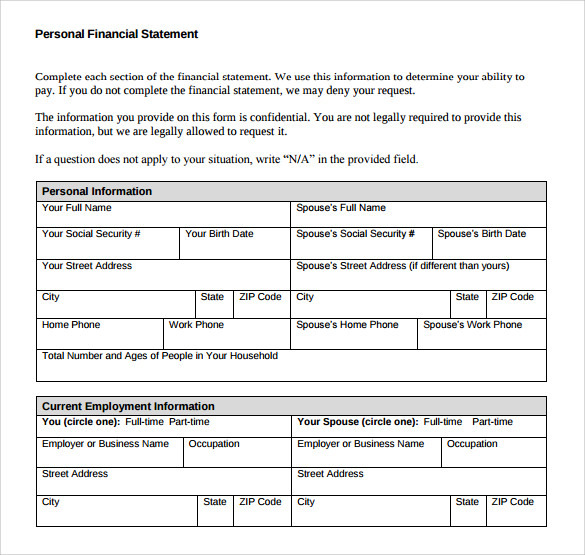 When Does a Personal Financial Statements uses? These Financial Statements are widely used by individuals from different sectors when there is a requirement of financial planning raises. There are various formats are available here from which you can choose your desired one. It is very helpful for keeping a track of your daily expenses in weekly as well as monthly basis. It also carries all the details about your profit and losses in an organized manner. It also helps the user for planning to pay their taxes at the end of the financial years. These are mainly used by individuals where there is a scope for maintaining their expenses and incomes in a monthly basis. There are number of benefits associated with these templates. First of all, it helps to plan your financial year accordingly with the basis of f your expenses. It helps to manipulate the expenses that are going to be occurred during a particular time frame as well. 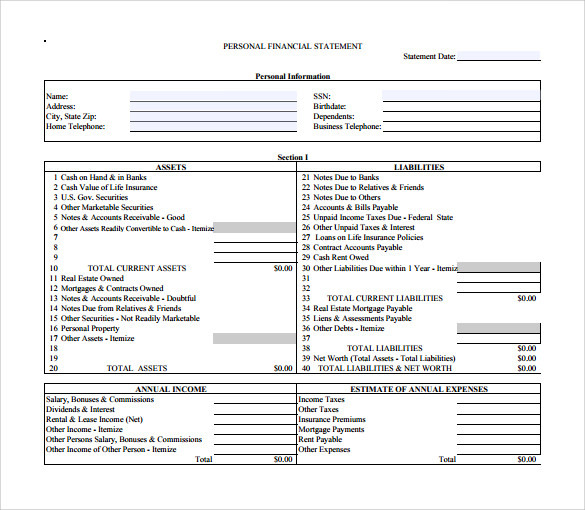 These types of templates often found very helpful for keeping track of your daily expenses in weekly as well as monthly basis. It also helps for creating and developing financial condition at the end of the month. When anyone is dealing with their monthly budget, their basic duty needs to be designed in a monthly as well as yearly manner! This is a result, why this type of templates is used. They are available in various formats so that you can choose your own and make them customized as well.You can also see Sample Financial Statements.